As a young man, Bowers went to sea. At first, it seems, he was on merchant ships, then he joined the navy. Bowers sailed around the world four separate times. In 1905, he joined the Royal Indian Marine Service as a sub-lieutenant serving in Ceylon, Burma and in the Persian Gulf. All along Bowers pursued his boyhood interest in the study of such things as butterflies and birds (thus his nick-name, "Birdie Bowers." So too, he became interested in photography. Bowers impressed his superior officers, such, that more than one of them, directly recommended to Scott that he would be a good addition to Scott's exploratory expedition then in the planning stages. (From boyhood, Bowers was interested in Antarctica.) Scott brought him on, sight unseen, notwithstanding that Bowers had no Polar experience (nor did most of them). As it turned out, Bowers was the only member of the expedition not to be even interviewed (there were 8000 applicants). It is speculated that Scott was keen to have another navigator with him, and Bowers was good one, honed his skills in the navy. Though, upon upon meeting him, Scott was not so impressed by the short, stout young man. "Well, we're landed with him now, and must make the best of it" said Scott in his journal. Scott view of the man was to change. In Scott's words, Bowers became "one of my closest and soundest friends." And another time, Bowers "is a perfect treasure, enters into one's ideas at once, and evidently thoroughly understands the principles of the game." "Bowers is all and more than I ever expected of him. He is a positive treasure, absolutely trustworthy and prodigiously energetic. He is about the hardest man amongst us, and that is saying a good deal—nothing seems to hurt his tough little body and certainly no hardship daunts his spirit. I shall have a hundred little tales to tell you of his indefatigable zeal, his unselfishness, and his inextinguishable good humour. He surprises always, for his intelligence is of quite a high order and his memory for details most exceptional. You can imagine him, as he is, an indispensable assistant to me in every detail concerning the management and organisation of our sledging work and a delightful companion on the march." "Little Bowers remains a marvel -- he is thoroughly enjoying himself. I leave all the provision arrangement in his hands, and at all times he knows exactly how we stand, or how each returning party should fare. It has been a complicated business to redistribute stores at various stages of re-organisation, but not one single mistake has been made. In addition to the stores, he keeps the most thorough and conscientious meteorological record, and to this he now adds the duty of observer and photographer. Nothing comes amiss to him, and no work is too hard. It is a difficulty to get him into the tent; he seems quite oblivious of the cold, and he lies coiled in his bag writing and working out sights long after the others are asleep." I write when we are very near the end of our journey, and I am finishing it in company with two gallant, noble gentlemen. One of these is your son. He had come to be one of my closest and soundest friends, and I appreciate his wonderful upright nature, his ability and energy. As the troubles have thickened his dauntless spirit ever shone brighter and he has remained cheerful, hopeful, and indomitable to the end. PS: To the end he has talked of you and his sisters. One sees what a happy home he must have had and perhaps it is well to look back on nothing but happiness. He remains unselfish, self-reliant and splendidly hopeful to the end, believing in God's mercy to you." We should note that Scott wrote only to the mother of Bowers and the wife of Wilson, Bowers and Wilson being the last two with him in the tent where all three died -- starved, dehydrated and frozen. 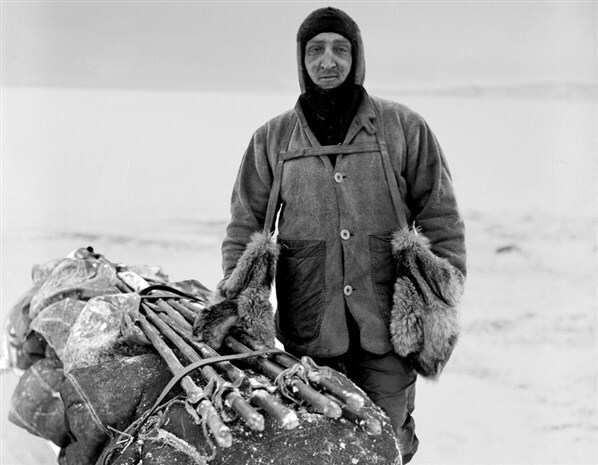 With Scott on the Terra Nova Expedition, indeed, as a trusted friend and navigator, Birdie Bowers was one of the five that made it to the pole; on the way back he died along with his four companions. http://www.hands-on-illustrations.co.uk/big/mn/23/28.pdf From Scott's Journal, we read, when aboard the Terra Nova "I read Service in the wardroom." At Xmas, 1911: "There was full attendance at the Service this morning and a lusty singing of hymns."